The Hot Ash Rocket Stove takes open flame cooking to a whole new level. Basically, the stove consists of a burn chamber where you insert the fuel coupled to a chimney. The strong upward air current created in the conduit causes the flame to be much hotter and concentrated. The Hot Ash Rocket Stove is the solution to the prevailing less hot flame and heat loss problems of conventional wood burning stoves. The flame produced is hotter; therefore, you should expect improved boil and cook times. The material used is not susceptible to heat loss. What makes this rocket stove such a resourceful cooking system is the burn chamber and chimney design. The weight may be an issue for ultra-light backpackers, but it is surely light enough for regular backpacking trips. Continue reading this Hot Ash Stove Review to learn more about this amazing outdoor rocket cookware. The Hot Ash Rocket Stove comes in a well-packed compact box. When you unpack and retrieve the stove out of the box, you get two large parts, crossbars, two screws, and two metal pieces that are important for the stand. The stove also comes with a Hot Ash stuff sack for storage and transportation of the stove. The stove is bought as a complete system. There is no part that you will be required to buy separately for the stove to operate. It weighs 3 pounds and it is collapsible. Therefore, it is remarkably easy to repack it in the stuff sack for easy storage and transportation. The Hot Ash Rocket Stove is one of the lightest rocket stoves on the market, weighing in at 3 pounds. The design is not only ergonomic and user-friendly but also simple to assemble and collapse. It measures 3 by 7.25 by 8.9 inches when fully assembled, and 3 by 3.25 by 88.9 inches when collapsed. What you will notice when you pull the stove out of the box is that the burn chamber and chimney are merged and screwed. The crossbars and the feed plate stow away in the space provided by the two large parts that are merged together. The stove is engineered from stainless steel material that is known to have very good features. Stainless steel is rugged, scratch-proof and weatherproof. This material has a reputation of burning very hot with minimal heat loss, and stainless steel is also easy to clean, you will not have a hard time getting rid of the soot. The slanting plate screwed at the burn chamber transforms the feed mouth into a gravity self-feeding mouth. All you have to do is place firewood in the inclined position and gravity will continue to feed the fire. This is very resourceful since there is no need of you pushing the wood every now and then. Another useful design feature is the integration of crossbars pot support. The two crossbars fit perfectly on top of the grate to form a sturdy pot stand, which can support smaller cooking pots and cups. They also improve the stability of the stove. Assembling the stove is very simple; you just have to go through the instructions once. The burn chamber and the conduit are designed to fit perfectly into each other. However, it is recommended you start the assembly with the front stand. There is a slot on the front stand and the burn chamber through which you will attach the two parts and then use one of the wing screws to tighten. Attach the conduit to the burn chamber and use the other wing screw to hold it into place. Do not forget to line up the stand before screwing. The final step in the assembly is the installation of the crossbars, which is pretty simple. All you have to do is place them into position. The resulting pot stand will allow you to use smaller cooking pots. This system is only visible once you have completely assembled the stove. There are vent holes along the burn chamber and at the base of the conduit. The vent holes form the airflow system, which is crucial for effective combustion. Air flows in through the vent holes located in the burn chamber all the way to the vent holes just beneath the fuel. The air ensures that the flame keeps burning hot. Apart from the airflow holes, air gets in through other openings. You can use twigs, small sticks and branches to start and sustain a fire. The easiest way to start a fire is through the conduit/chimney. Just remove the crossbars, add some dry tree bark or grass and start a fire. For more tips on how to effectively use a hot ash stove for safety, read our article on this topic. Then re-position the crossbars and feed sticks, twigs or branches through the feeding door. You should be strategic with the fuel you are using since this will determine the kind of flame you will be able to produce and sustain. 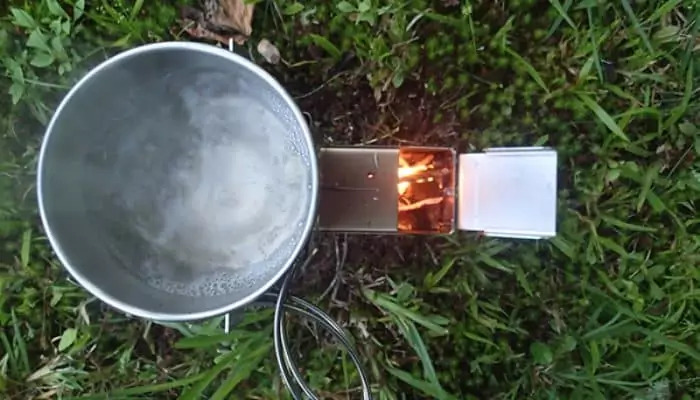 You can easily test the efficiency of the flame by boiling two cups of water in a cooking pot. You should time the water to see how long it will take to boil. Nevertheless, the boil time will be determined by the produced flame. So, you have to keep on feeding the fire to produce a hotter flame. It will take you approximately ten minutes to boil two cups of water. This is pretty resourceful for a camper or hiker. That means it will take you less time to warm up meals or prepare instant hot meals. Unlike most backpacking stoves that are constantly affected by the wind, the Hot Ash Rocket Stove is basically windproof. The chimney protects the flame from the wind regardless of the direction. This is an ingenious design that can do wonders in an open field. You might see the Hot Ash Rocket Stove as an expensive model if you attempt to compare it with alcohol stoves. Nonetheless, its market value is reasonable if you consider all the features it comes with. The stove does not come with a cooking pot; so you will have to buy one separately. The Versa EcoZoom Rocket Stove is a good combination of strength, weight, portability and safety. The stove’s ergonomics and user-friendly nature make it a great gear for emergency preparedness, camping and outdoor. It is much easier to use this model than making a full campfire. The design looks more of a metal bucket, but with unique fittings. The interior is made up of ceramic and consists of a cooking grate and a funnel. The two integrated doors play a significant role in the stove’s performance; the larger door is for fueling and the smaller door is for airflow control. As opposed to a traditional charcoal fire, you can easily adjust the temperature. The stove is incorporated with a durable cast iron grate that allows you to get every last bit of heat from the fuel before it falls through to the lower chamber. By fuel, we mean wood, charcoal, and solid biomass. A good outdoor or home backyard stove has to be versatile in every regard. The resourcefulness of the Versa is the use of multi-fuel. Most outdoorsmen would prefer to use brushwood, branches, and twigs, but you can always use charcoal and biomass. There is no way you can question the safety of this stove because the design is quite impressive. The ceramic material conserves most of the heat; therefore, less heat is passed to the metallic parts. So, you will rarely burn yourself since the metallic parts are never scorching hot. It’s obvious that the Hot Ash Rocket Stove is lighter, compact, collapsible, and a very effective backpacking stove. 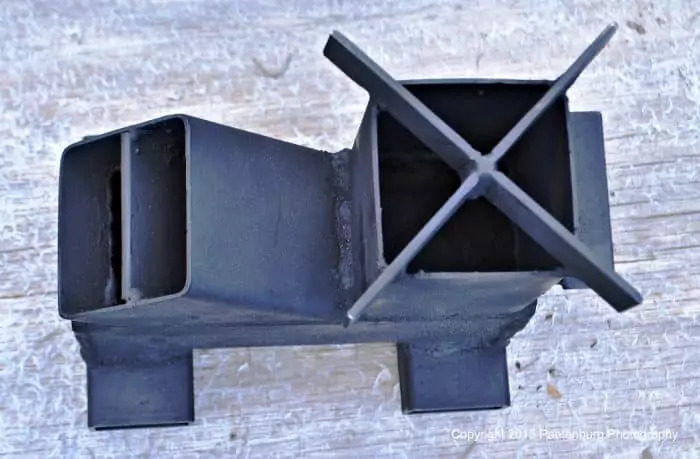 The same cannot be said of the EcoZoom Rocket Stove regardless of the fact that it is more efficient because it is heavier and less compact. It is without a doubt that the EcoZoom is not a convenient ultra-light backpacking stove. 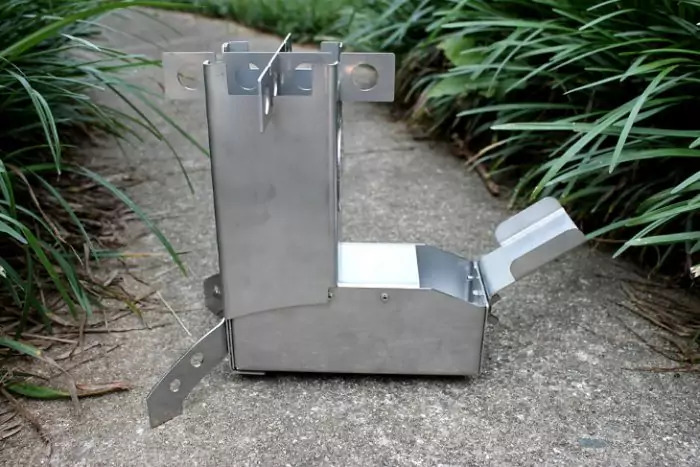 The Heavy Duty Grover Rocket Stove is one of the upcoming favorites. 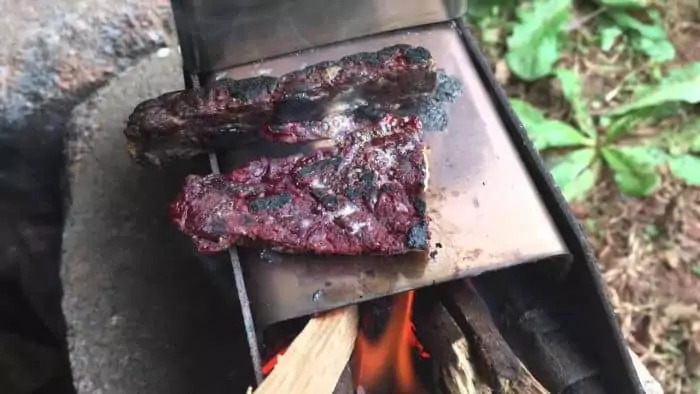 It is a good choice not only because it is very well-made, but it has good interior insulation that forces heat to the top to increase cooking temperature. As we continue unfolding the unique features of this stove, you should know that it is among the heaviest. 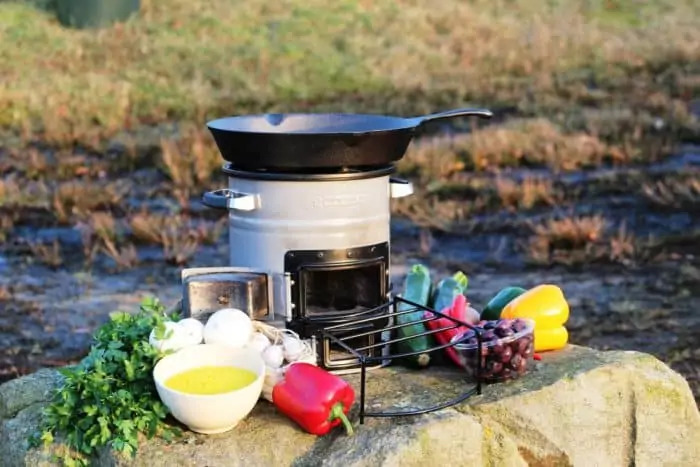 If you have been a longtime backpacker, you will be surprised by the weight of this outdoor stove. The one thing that makes the stove weigh 17 pounds is the 11 gauge cold rolled steel material. If you have never used this stove, you will certainly love the rigid design that is very efficient and reliable. 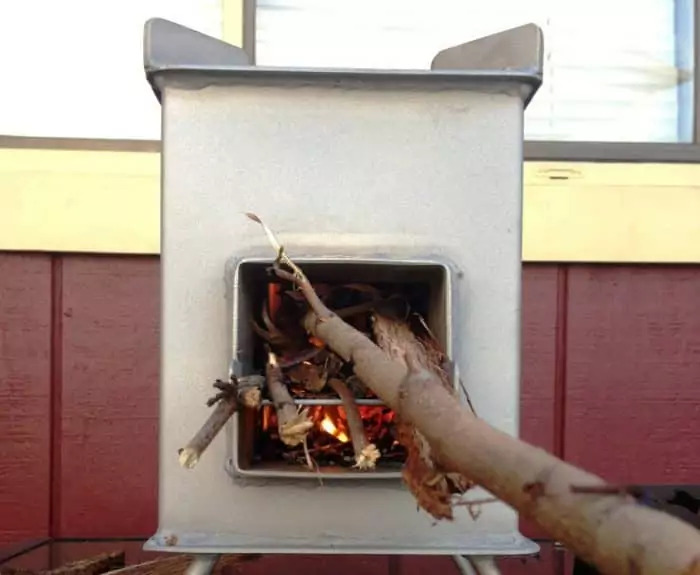 Unlike conventional wood-burning stoves that have a tendency of using excess wood and lose a lot of energy in the process, the Grover Rocket Stove is designed for efficiency. With the Grover, you can use anything that burns. The integrated insulation directs heat towards the cook pot. 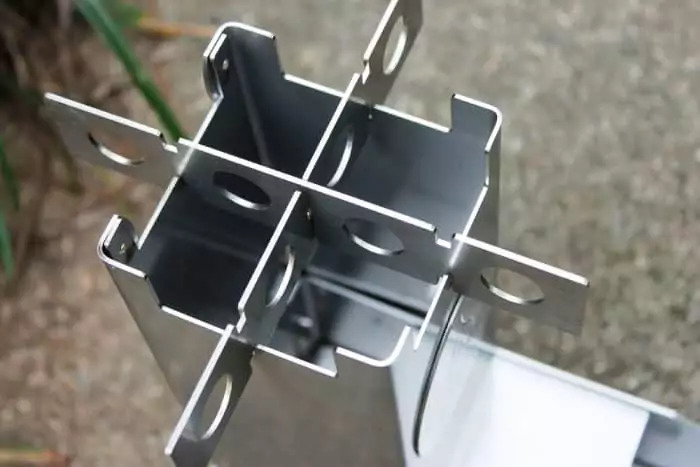 The pot stand is made up of 4, 7-inch aluminum top plates that do a great job of distributing heat evenly on the surface of your cooking pot. There is a heavy duty handle for easy carry and transportation. The amazing design is completed by the flat tongue mouth that fuels the stove and supplies oxygen to the burning fire. There are perceptible differences between the Hot Ash and Grover rocket stoves, especially on the design. Grover is heavier and more rigid while Hot Ash is lighter and compact. You should definitely go with the Hot Ash, if you are a backpacking enthusiast and leave the Grover for car campers. The Grover Rocket Stove is very efficient when compared to the Hot Ash Rocket Stove, that’s if you do not mind the weight. 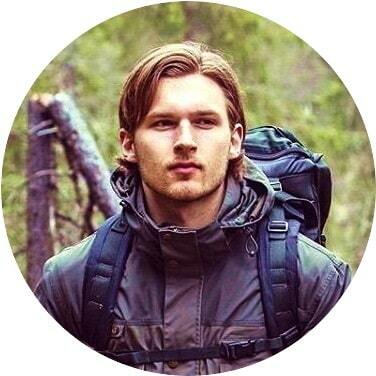 Heavy cooking systems are not suitable for backpackers, so if I were you I will go with the Hot Ash for backpacking. 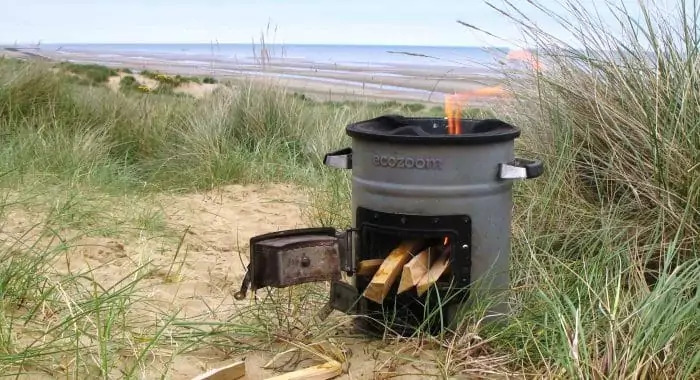 The Bullet Proof 308 Rocket Stove is what you go for if you want a stove that is not only rigid but also capable of handling abuse. It is one of the heaviest outdoor stoves, which weighs 17 pounds. The 11ga steel material is what makes the stove weigh too much. 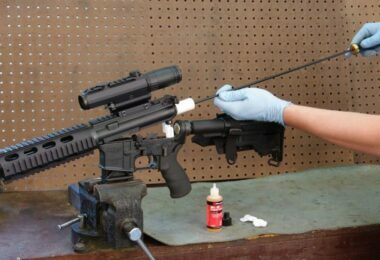 The 11ga steel is known to be very effective as far as burning fuel is concerned. Everything about this stove is big; large fuel chamber, large feeding port, and large base. This simply means the stove is very durable and robust. 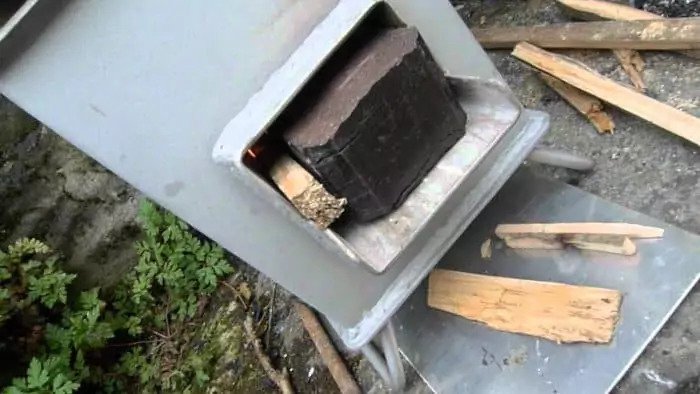 A feature unique to this stove is the gravity self-feeding mouth, all you have to do is feed wood into the mouth and let gravity pull it into the fire. The stove’s grate is engineered to last. The internal fuel shelf is 1/8th-inch welded for durability, and it will never warp or burn out. The stove is remarkably versatile. With the open grate, you can add fuel through the chimney or plenum. If you pay close attention to each and every feature of the stove, you will agree that the Bullet Proof 308 is the ultimate emergency stove, especially during natural disasters. The Hot Ash and Bullet Proof 308 Rocket stoves have close resemblance as far as the designs are concerned. However, the Hot Ash is lighter and collapsible, but the Bullet Proof 308 is heavier and welded. The common fuel between the two stoves is wood. 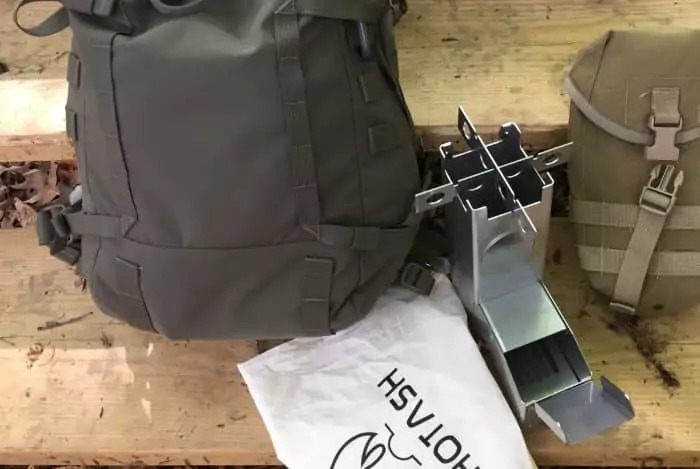 Light backpackers should go for the Hot Ash Rocket Stove without hesitation because it fulfills the requirements of a light backpacking stove. However, you will need the Bullet Proof 308 Rocket Stove during natural disasters. As we have learned in the review, the Hot Ash Stove is a remarkable and simple feat of engineering. Basically, it consists of a long hollow bench with a hole in the top on one end and another to vent out the other end. You put twigs, sticks or branches into the hole as if you had kindling standing in a bucket. The fire below burns the ends of the brushwood and then blows into the conduit along the bench that burns and recirculates the heat. The chimney passes through the other end of the bench and heat from the small fire warms the conduit before sending the exhaust out. The exhaust is just gasses. This does not mean that you will be able to completely avoid smoke since a little smoke is common when you light up a fire for the first time. The Hot Ash stove uses 90% less fuel when compared to a standard wood burning stove. The abundance of features makes this stove quite resourceful. 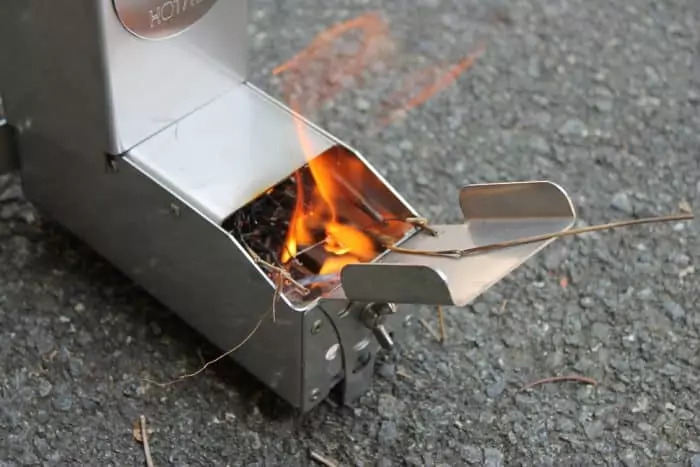 If you are looking for an emergency camping stove, the Hot Ash stove will work for you as it does not require you to carry fuel. 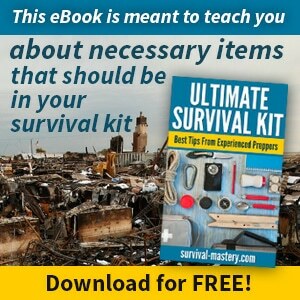 The product is most suitable for preppers, survivalists, and bushcrafters. As this product gives results quite similar to a Dakota fire pit, with little to no smoke, it can be used by survivalists when on the move. The stove is also great for car campers. Where space rather than weight is a problem, this product fits just right both because of its compact size and the lack of necessity to carry extra fuel. 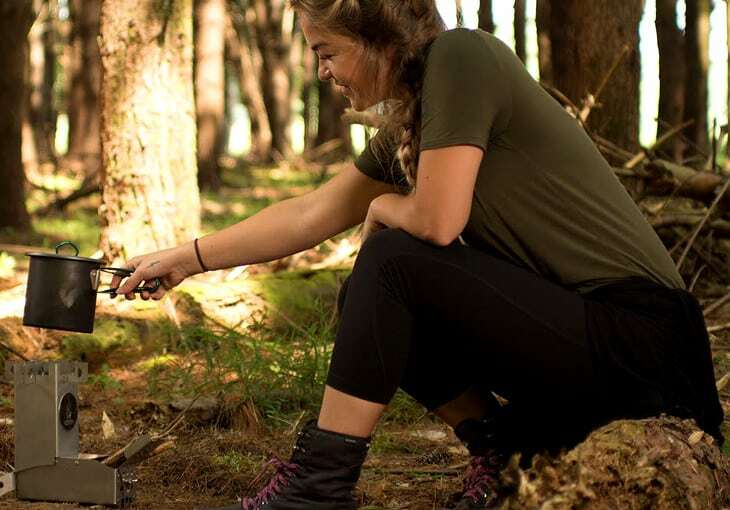 If you like the old-fashioned way of exploring the wilderness with campfires, you can enjoy a similar experience with the Hot Ash stove, in a modern, safer, and easier way. 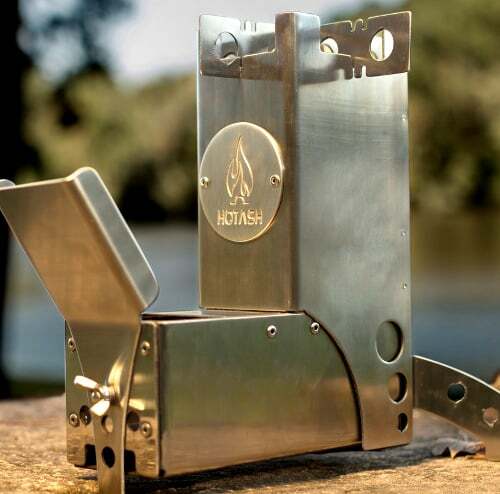 The Hot Ash Rocket Stove is one of the simplest yet very handy backpacking stove that any outdoorsman should try. 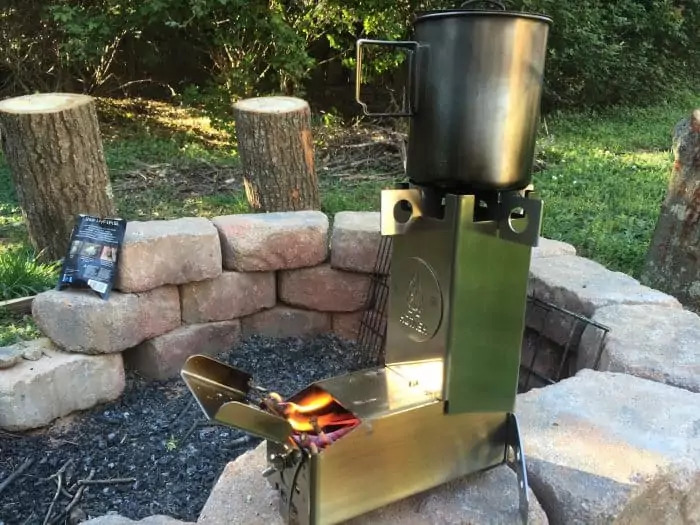 This masterpiece is nothing like the other rocket stove models you can find on the market. The manufacturer had the user’s best interest when developing this product. The various features are proof that the Hot Ash is worth the money. 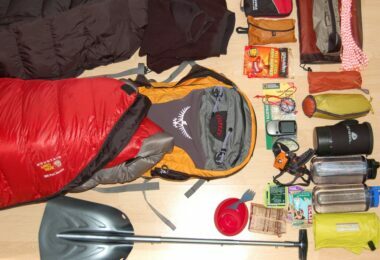 You might complain about the weight, but we believe it is one aspect that a backpacker can overlook. Well, we think it is the lightest among the best rocket stoves on the market. 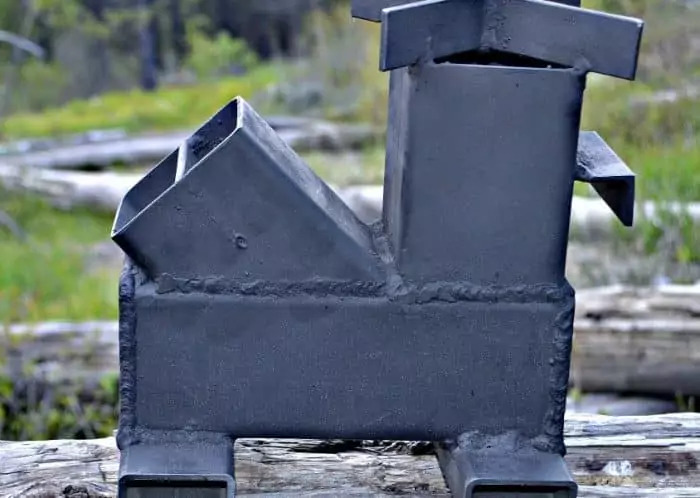 The Hot Ash Rocket Stove is the simplest backpacking stove for campers and hikers among other out-of-doors enthusiasts. 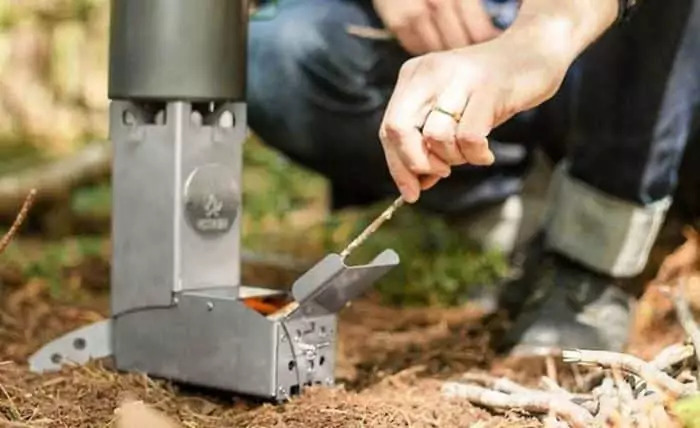 This stove was built for everyone; it does not matter whether you are an expert or a novice outdoorsman. It is the easiest to assemble and use. It has all the important features a camping stove is expected to have, and it never fails to boil you coffee water or cook an instant meal. Find out how to be more safe while camping by reading our guidelines on this important topic. Did you buy and use this product? How did it perform? Did you face any challenges with the design and performance? Please share your experiences and thoughts with us in the comments below.